DEOLINDA debuts with an irresistible concept album that captures the tension between old and new Lisbon, between traditional fado and the future. In the short time since its Portuguese release at the end of 2008, Canção ao Lado (The Song Next Door) has shot from nowhere into the Portuguese charts and achieved Platinum status. An intriguing concept album, Canção ao Lado (pronounced Can-SOW ow LAH-doe) is delivered ‘live’ in a series of wildly flamboyant concerts that have drawn audiences in Portugal that range from the 30-something age group of the musicians to grandparents and small children. The secret to their popularity comes in equal parts from their exuberant, often comic performances, the sweet and catchy melodies, and lyrics loaded with emotive references to fado and other lesser-known Portuguese musical traditions. 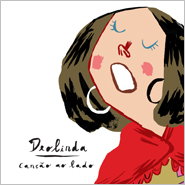 The album’s 14 songs of Deolinda, the band, are built around the character of Deolinda, the fictional character, a young woman who lives with her cats and goldfish in a Lisbon apartment and watches through her window as the world go by. The songs are delivered by a dynamic, charismatic singer who goes by the name Ana Bacalhau (literally, Ana Salted Cod). Deolinda and the passing characters she introduces us to are the creations of the project’s songwriter and guitarist, Pedro da Silva Martins, and are performed with the other musicians: conservatoire-trained Luis José Martins on guitar, ukulele, viola and Portuguese cavaco and guitarlele, and double bass player Zé Pedro Leitão (meaning Suckling Pig), who brings a classical and jazz background. The group’s desire to travel with minimal baggage led to a pared-down touring line-up of two guitars, a double bass, and vocals, which they took to the road, spreading the Deolinda story, chapter by chapter. Building a reputation by word of mouth, by 2007 they had recorded the songs and were surprised to find record labels excited about the concept and the band. The debut album’s title, Canção ao Lado (The Song Next Door) refers to influences from Portugal’s musical styles including fado, and Cape Verdean morna, and Brazilian music. The mellow ’Não sei falar de amor’ (I don’t know how to talk about love) makes the connection with Brazil, a reminder, says Ana, “that we can’t escape Elis Regina and Chico Buarque.” ’Clandestino’ recreates the atmosphere of Old Portugal under the dictator Salazar, before the Revolution. “It’s about a couple; the woman has been persecuted by the police and doesn’t know if her lover is coming back that night or not. He comes and brings a gift for her and their baby, but the police arrive and she defiantly sings, “I kissed him and took him in my arms…” Deolinda leave the song unfinished because, Ana explains, the song is also about the universal tragedy of forbidden, “unfinished” love. Fado, Portugal’s most famous musical song form, runs through the collection although Deolinda are quick to note that even these songs are best described as “fado with a twist.” No black shawls (the fado symbol of tragic women) appear in these songs, or on Deolinda’s lead singer. Instead, Ana wears brightly patterned costumes influenced by the rural folk traditions of Portugal (including the regions of Madeira and Estremadura), matching their colors to the music, and adding modern touches that underscore the group’s musical influences, which clearly stretch from traditional to pop.